Children at Cowie Primary School were left inspired about reading from a true sporting great today when Sir Chris Hoy dropped in to open their new library. The six-time Olympic gold medallist has turned his hand to writing children’s books since calling time on a stellar cycling career. He has now published nine books on the adventures of Flying Fergus, a nine-year-old with a magical bicycle and a vivid imagination. And after cutting the ribbon at the school’s new facility, the cycling legend sat down with pupils to tell them his story of becoming a reader, before answering a wide range of questions. Sir Chris agreed to visit the school following an email from P.7 teacher, Donna Bullivant, who had attended one of his events at the Edinburgh Book Festival in August, along with her husband, Scot, and young son Bradley (4). Afterwards, Scot suggested that Donna invite the 11-time World Champion to open the school’s new library. She quickly received a reply to her email with the news that Sir Chris would be delighted to come along. A few months later, Scotland's greatest Olympian duly arrived at Cowie PS and was afforded a hero’s welcome, with P1 and P7 pupils lining up in a guard of honour on bikes outside the front door to greet him as he entered the building. Sir Chris said: “It was an absolute pleasure to come and open this wonderful new library and hear about the school’s culture of reading, and a huge thanks to all the pupils and staff for the warm welcome. “I really enjoyed chatting to the children and answering their excellent questions about reading and cycling. “I wasn’t an avid reader as a child and needed a lot of encouragement, but once I found a series of books or author that I enjoyed, I really loved it. “At seven or eight, I discovered Roald Dahl, who was my hero, and read James and the Giant Peach. I loved it but my favourite book without a doubt is George’s Marvellous Medicine. “I wasn’t a great sportsperson when I young and it took a lot of hard work to become an Olympic champion. “By writing the Flying Fergus books, I wanted to get a message across that you have to work hard to do exciting things. Headteacher at Cowie Primary School, Paula Harris, said: “We were delighted to welcome, six-time Olympic gold medal winning cyclist, Sir Chris Hoy, to talk bikes and books and to officially launch our new school library. “It was so inspiring for the children to hear a sporting superstar like him speak about his journey as a reader and author, and hear about his incredible achievements in cycling. “We want to develop a reading culture within the school and the new library has really helped bring this vision to life and Sir Chris’ visit will continue to drive this forward. Work on transforming an empty classroom into a modern learning space took started last May and took around four months to complete. Pupils were consulted throughout the project, whether that was choosing what books to order in, deciding on the colour of the décor or picking Roald Dahl characters to adorn the walls. Along with a wide selection of reading material, the new library contains digital technology, ranging from laptops to iPads. Since being granted access to their new facility in September, the children have enthusiastically embraced it, and even after the school day is finished, it’s used by the homework club. As part of the school’s aim of fostering a passion for reading among children, they have also developed links with Cowie Library and local librarian Chris Mitchell. Convener of the Children and Young People Committee, Councillor Susan McGill said: “To have someone of Sir Chris Hoy’s stature open the school’s library and speak about his love of books to the pupils is a fantastic feel-good story and it was a privilege to come along to the event. Vice Convener for the Children and Young People Committee, Councillor Margaret Brisley said: “Everyone involved in bringing this project to life should be proud, particularly the children who were heavily involved in its design, and it was brilliant that one of our sporting heroes gave up his time to cut the ribbon and chat to pupils. 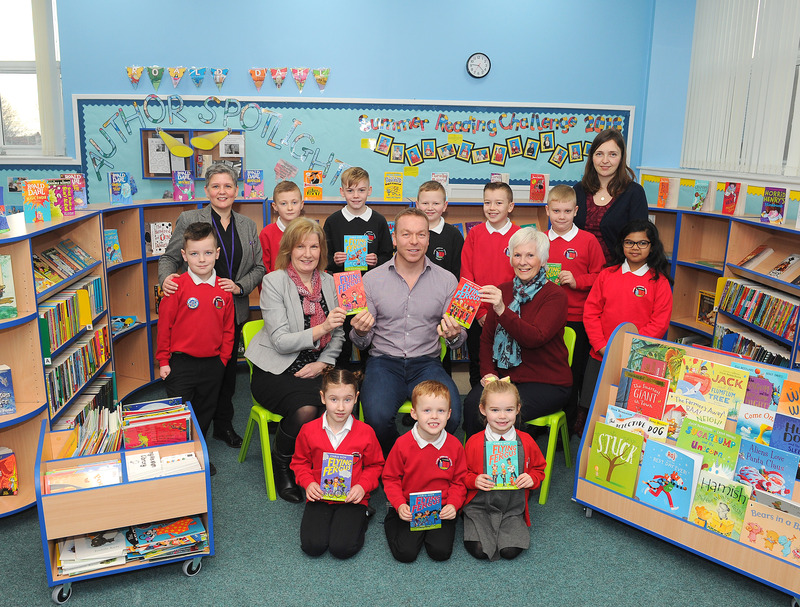 Picture shows Scotland's greatest Olympian, Sir Chris Hoy, alongside staff - Headteacher Paula Harris (top left) and P7 teacher Donna Bullivant (top right) - and pupils from Cowie Primary School, and Cllrs Susan McGill (sitting left) and Margaret Brisley (sitting right) in the new library.